Due to lack of understanding of stock markets, beginners as well as frequent traders end up committing very common mistakes. Both type of Traders can benefit by learning about these common errors and how to avoid them. Everyone wants to make money; however, not all succeed. Due to lack of understanding of stock markets, beginners as well as frequent traders end up committing very common mistakes. Both type of Traders can benefit by learning about these common errors and how to avoid them. Investing without knowing the fundamentals of a company often leads to losses. Traders must study the company’s whereabouts, know the right time or target price at which they should sell a stock, stop losses, before they decide to invest in a particular stock. To improve their trading strategy, traders can try different patterns of trades and finalize on a specific/appropriate method that gives them better gains and avoid methods that have lead to losses. Put multiple trades using different methods to arrive at the best method. Many Traders predict that if the price has gone very high, it will not go up any further and based on this notion they end up selling stocks. However, this is not best way to take a call on buy/sell/hold. It is always better to analyze a company in detail, its valuation, growth prospects and more, to arrive on this decision. Similarly, if price falls by a significant value, traders start buying a stock believing it will not fall further and it would be a profitable bet. However, stocks can go down or up to any level when the markets are turbulent or market fundamentals go wrong. Nobody can guess at what level a stock will make a top or bottom. Traders should estimate the value of the stock and decide the buy price within 5%-10% range from their estimated price. If stock price falls below the buy price for a trader or if a trade fails to generate returns as expected, they keep losing more and more money in hope of recovery. However, it may never happen, a correction may never be achieved. Exit when the time is right. Traders sometimes end up selling a stock too early without realizing if the time is right or if there is an exit signal. Traders must hold a stock for long term if the stock is good fundamentally and seems promising in future. Traders usually are very likely to not have a very well thought opinion on markets going bullish/bearish. However, it totally depends on market fundamentals and may/may not prove to be true. Please remember there is never a guarantee that an advisor or fund manager is always likely to give correct view on a stock. Although, it is their primary job and they are experts, traders must always use their conviction if they want to act on the opinion given by experts/advisors. Mistakes happen – no matter how long you have been trading. Keep in mind the above mentioned points. 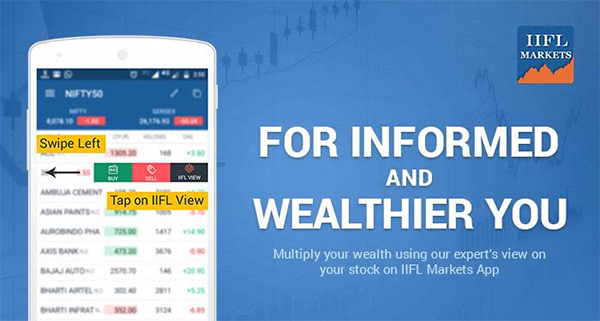 When in doubt about a particular stock, you can also go to IIFL Markets Mobile App and Check our expert’s View on buy/sell/accumulate on 500+ stocks.